"Landscape is a question of distance. Patterns and formations become recognizable from a distance revealing the landscape as a fabrication, a result of natural and historical movements. 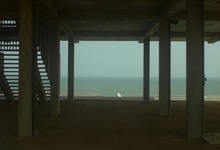 Fishing Is Not Done On Tuesday takes variously distanced, moving and focused looks at a location on the coast of Ghana.